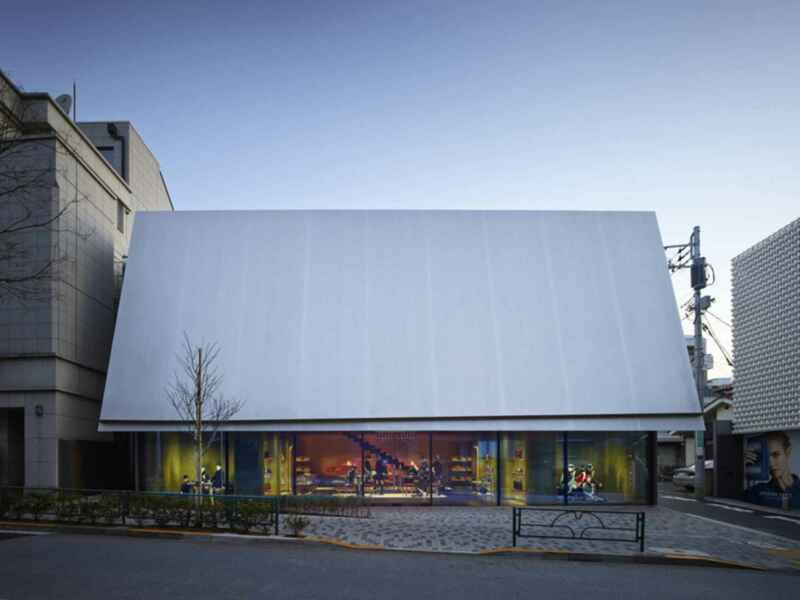 Set in Aoyama, an ultra sophisticated shopping area, Miu Miu looked to Herzog & de Meuron to create a flagship store just as sophisticated as its address. The design intent was to peek people's curiosity of what's inside and to contrast the simple exterior to the materially rich interiors. The store greets you with an over-sized canopy/awning with a slit at the end of the canopy. This metal awning also provides shading for its interiors while providing passer-bys a peek inside. On entering the store, a visitor can both see and feel understated exuberance and richness of materials inside such as the use of shiny pressed copper surfaces on walls that are also used as awning, as well as the unusual interior architectural elements and furnishings all being upholstered in soft green brocade.